• Support that Lasts: With a weight range from 15-45lbs., or begin at 7lbs. 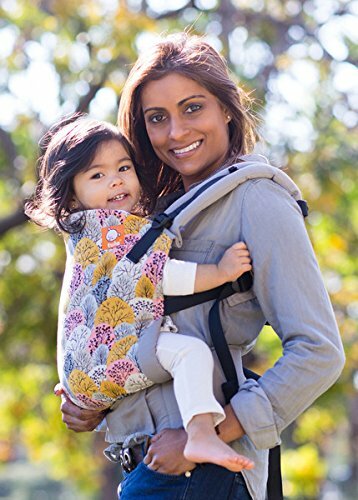 when combined with the Tula Infant Insert, you can be rest assured that you and your baby will be safe and comfortable for whenever or wherever you may go! • Feels Good on You: Superior comfort provided by the wide panel and waistband to help evenly distribute weight; and padded shoulder straps that prevent pressure or pain. Made with quality, breathable fabrics. • Multiple Ergonomic Positions: Front and Back carry positions are all you need to get a natural, ergonomic position best for long term, comfortable carrying that promotes healthy hip and spine development for your baby. • User Friendly and Fits Your Size: No fuss design that is easily adjustable to fit many body types so you and baby can move as one! Just a few simple steps to get the carrier on and off quickly. • Show off Your Style: Unique, stylish prints that let you continue to express your personal style as you transition into parenthood and the years beyond. • Award-Winning: Our carriers have been tested for safety and won multiple awards for design and innovation. Voted best baby carrier by parents! Join the many families who have found the ultimate baby carrier that doesn't overcomplicate quality, comfort, and style. Find your fit, choose your style, and keep on doing what you love! If you have any questions about this product by Baby Tula, contact us by completing and submitting the form below. If you are looking for a specif part number, please include it with your message.